Whether you have dogs, horses, chickens, rabbits, livestock, or just about any pet, we can help you design the perfect place for them. Custom sheds for your every backyard need. Our team will be happy to assit you on choosing the perfect options for your dream shed. A garden pavilion is the perfect backdrop for all your best landscaping work. Create the perfect backyard oasis to enjoy the seasons, relax with afternoon tea or admire your award-winning roses or colorful flower beds. Your garden pavilion awaits! Why let the inviting feeling of home stop at your door? Create an outdoor family room that your neighbors will admire and your family will love. 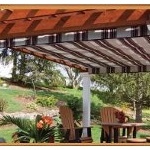 With your new Traditional Pergola, don't be surprised if your next family barbecue or game night draws an eager crowd! Our outdoor rooms offer the space you need for an office, entertainment area, hobby room, sunroom or just about anything else you've been dreaming about! With sizes ranging from 8 x 8 to 16 x 32, we're sure you'll find the right room for your needs and budget.